Yesterday I took a trip to Selfridges and whilst I was there I thought I'd take a trip to the baby section. Who knew that the only thing I'd be able to afford in there was a pair of baby socks at £12 for a pair! I had a good look around anyway - feeling a little bit like Julia Roberts in Pretty Woman - yes I know I can't afford any of this stuff but there's no need to look down on me! It got me thinking - if I was rich, if I did have a millionaire lifestyle, would I be prepared to pay £12 for a pair of newborn baby socks? I mean, even if I won the jackpot tomorrow, I'm pretty sure I'd still be heading off to see (dare I say it) good old George at ASDA for my baby socks! It's not just designer clothing that's needed to keep me ahead in the fashion stakes, it's all of the accessories too! Last season's top selling pram at Very.co.uk was the Maclaren Juicy Couture Pushchair and it's still going strong - it seems you fashionistas out there can't get enough! Then there's the all important changing bag - if only I could affford a Gucci at £570 - unfortunately I didn't even have that much to spend on a pram! So I think, at least until I win the lottery or I become a famous fashion blogger with designers throwing their fab baby couture at me I'll just have to rely on cheap baby basics but I'm sure my daughter will forgive me! 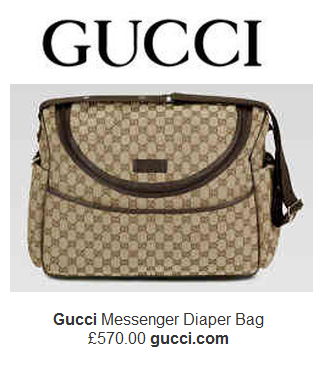 i think if i had money to spend on that i wouldn't maybe on the Gucci diaper bag and stroller but not clothes that she'd grow out of in a few weeks! just keep in mind that you cant take that stuff with you when you die! 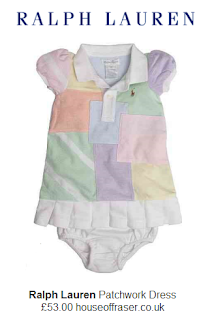 i think that baby designer gear is a waste of time, frankly alot of the clothes are vile anyway. Give me highstreet/supermarket gear any day!! 3 weeks to go but couldn't wait!